’ second cookbook Lose Weight By Eating Detox Week Has helped thousands of people lose weight fast, and keep it off! The second addition to my cookbook collection has arrived! You can order my new cookbook LOSE WEIGHT BY EATING-DETOX WEEK and start losing weight faster than ever before! 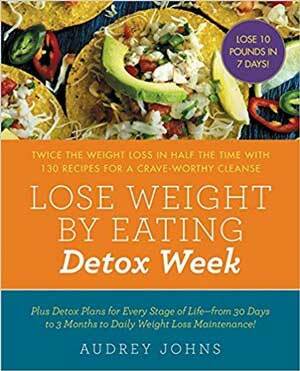 This new cookbook is based on my popular Detox Week post, after readers experienced fast, lasting weight loss (some up to 20 pounds in a single week!) I got to work writing a new cookbook. If you’ve tried the plan and want more recipes to work with, if you want more clean eating recipes, or want to start the Detox Week Plan this book is perfect for you! I packed this cookbook full of kid friendly and picky eater approved comfort food recipes like Mac and Cheese, Strawberry Milkshakes, Cheesecake, Pizza, Chicken Pot Pie and Brownies… but not before I shaved off 100’s of calories and turned these typically high calorie, high fat recipes into healthy delights you can enjoy everyday, and lose weight doing it. Instead of giving up the foods you love, try these filling and healthy recipes that curb your cravings and increase your metabolism. It’s filled with lots of beautiful photos, stunning enough to be used as a coffee table book. I included lots money saving tips, because weight loss shouldn’t cost you a fortune. 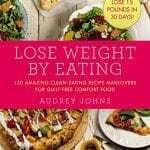 Included in the book is a free weight loss plan complete with menus, food logs and a weight loss tracker. We worked to keep the cost low so everyone can afford it. Over 130 delicious recipes that make your taste buds think you’re splurging, when in reality you’re increasing your metabolism and losing weight. Nearing the three-hundred-pound mark, I was eating under 1,000 calories per day of frozen “diet” meals, “zero calorie” sodas and “sugar free” treats and still gaining weight. After trying every major diet out there (and some scary ones, too), I was left with no lasting results, more broke than ever, and depressed. That’s when I decided to go back to the basics. I started by giving up my favorite zero-calorie sodas, artificial sweeteners, and preservatives and saw results right away. Within a month I started to look and feel amazing, but my cravings never stopped. By tweaking my favorite meals, I found ways to eat the food I craved all while losing pounds and later maintaining a new healthy weight. The WeightLossTopSecret plan is very easy to follow because there are no rules, only goals. By setting rules, all you’ll want is to break them, but by setting goals, you’ll strive and even beat them. And if you mess up, don’t worry— hit your reset button and start again tomorrow for a fresh start! 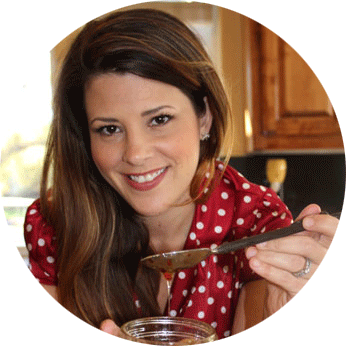 WHAT CAN YOU EXPECT FROM THE LOSE WEIGHT BY EATING COOKBOOK? WeightLossTopSecret is all about making the naughty nice. Giving your favorite foods a delicious, healthy makeover, you can eat what you love every day—and still shed those unwanted pounds. WeightLossTopSecret includes more than 130 mouthwatering recipes for family favorites, including pasta, scones, nachos, meatloaf, and cookies—all bursting with flavor and fewer than 500 calories per meal. Most recipes use simple and inexpensive smart swaps and are full of hidden vegetables that keep you feeling fuller longer, and all are picky-kid-friendly and husband-approved. Imagine losing eight to sixteen pounds the first week and fifteen to twenty-five pounds a month eating skinny pizzas with only 125 calories per slice or 150-calorie cheesecake! WeightLossTopSecret lets you enjoy these delights and more, such as “Jelly Doughnut” French Toast, California Club Pizza, Whole Roasted Chicken with Potatoes and Onions, Veggie Packed Lasagna, Cheddar Stuffed Turkey Burgers, Chocolate Peanut Butter Dip with Fruit, and Skinny Cheesecake with Raspberry Drizzle. Also provided in the book is a handy six-week meal plan and weight loss tips to keep you motivated. Lose weight by eating guilt-free, low-calorie, unprocessed versions of all your favorite foods, with this helpful, accessible diet and cookbook, featuring more than 130 clean eating recipes and gorgeous full-color photos. Order today. What do you have to lose, but the weight? !